February - A short month, it's amazing what a difference three days makes to a month. Pay day comes around sooner which is always a benefit. Jane experienced another birthday and there was a feeling that the years seem to be getting shorter as well, but that can't be possible. Our annual February holiday should have been in the Mumbles area of South Wales but the property we'd booked turned out to be unavailable and so accommodation was found in North Devon at Hartland Point. The usual suspects: Graham & Sue; Nick & Val; Martin & Kate and ourselves travelled down in separate cars to a remote farm near to Hartland Point. We had to travel for four miles down single track roads to get to the house so it was fairly remote. Considering it was February the weather was very kind and we didn't get wet all week although it was overcast on a couple of days. We had a great week, eating and drinking too much. There was also plenty of humour and lively conversation. 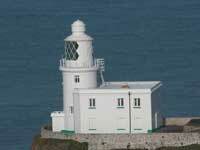 To visit the North Devon holiday page click here. We've heard about blogs and really this web site is a one sided blog but what's missing is the interaction with people who read pigyard.com regularly or stumble across it. By pure accident Steve came across this facility developed by Google and so we decided to set up a linked site. You can now join in with the pigyard experience by clicking on the blogger logo. It's a rare event for us to comment on the television that we watch and in fact this is the first time. The subject of discussion is BBCs "Life on Mars" which has been broadcast for the last 8 weeks on Monday evenings. The programme is a mix of Doctor Who, The Sweeney and Dalziel and Pascoe - imagine a modern day policeman who through the misfortune of a road accident that puts him into a coma he turns up as a copper in 1973. It is a real stretch of the imagination which is why it is so different, that along with some strong characters that are well acted, good storylines and well written scripts. It's too late to see the series but it will surely be repeated and they've already started working on the second series to be scheduled for next year. Rumours abound that the next series will take the comatose hero turn up in another time period but the producers are remaining tight lipped. For more details and comments click here. 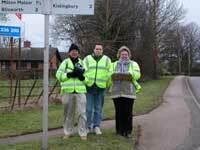 Jane has become responsible for the village speed watch campaign. She spent a couple of hours one Saturday learning how to use a speed gun and the way to undertake the speed watch events. After developing a rota for trained people within the village they are now meeting morning and evenings noting all the cars that exceed the limit on the main streets through. If a driver is caught twice during the campaign the police send a letter advising them to slow down. From poacher to gamekeeper - such is the way of the world. Steve has been making sure he avoids the village during the hours the teams are out doing their speed checks.